No doubt many Carlsbadians are familiar with the Carlsbad Art Wall, the brain child of well-known Carlsbad artist Bryan Snyder, in cooperation with the owner of Senor Grubby’s on Carlsbad Village Drive, who has allowed the very-visible east wall to be beautifully decorated with several new murals per year, beginning in 2015. 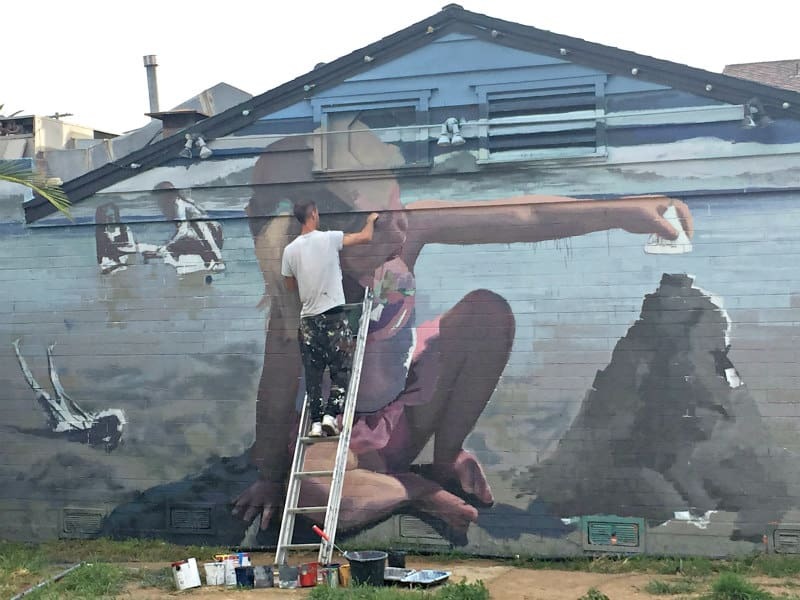 It’s been such fun to see the variety and talent of so many muralists, local and regional (e.g., LA), and now with an international flair with the latest wall mural created by muralist SLIM. SLIM is on tour in the US and we are indeed fortunate to have his talents showcased on the current Carlsbad Art Wall project being painted this weekend. I stopped by yesterday to watch while out running errands in the Village, but this weekend could be tough for watching SLIM paint, given the Carlsbad 5000 (Sunday) and Junior Carlsbad (today) with all the crowds, limited parking, and road closures. But if you decide to go, you can enjoy the mural unfolding AND cheer on the runners. I’ll be sure to share the finished product.